I regularly walk to a nearby college natatorium to swim laps. To my periodic astonishment, I will get an idea for a collage while staring at the bottom of a pool. 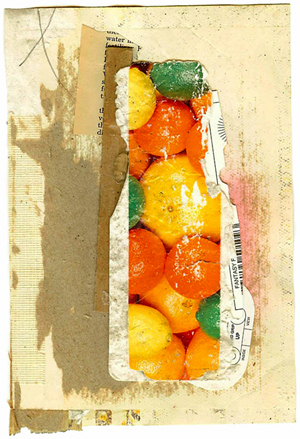 My mind apparently stays cluttered with images of unused ingredients, and I suppose they demand to be composed, even when I am absent from my studio. As I travel to and from the destination, no scrap of litter escapes my attention (an occupational practice for many collage artists). Recently, when I discovered a wadded-up candy or bubble-gum wrapper that looked to me like a tiny, mashed bird (or was it a disfigured fleur-de-lis? ), I knew I had to find a place for it, but I preferred that it not get lost in a “maximalist” design. So I encouraged myself to produce a collage with a minimal of elements. This is not my typical style, but I visually partake daily of numerous examples by peers who excel at this technique, if one can call it that. Thankfully, a bit of their approach may have rubbed off. 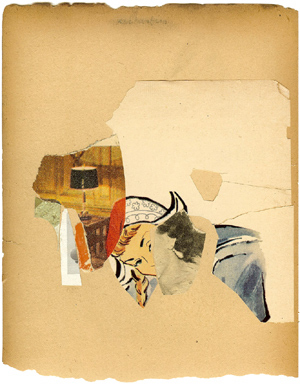 Laura Tringali Holmes has taken it another step by accepting the challenge of creating a collage under the influence of a particular fellow artist. Laura often leans in the direction of maximalism, as do I, and her skillful homage to Katrien De Blauwer, a master of minimalism, is worth a visit to her site. As you may know, I am keen on the cross-fertilization of solid influences. 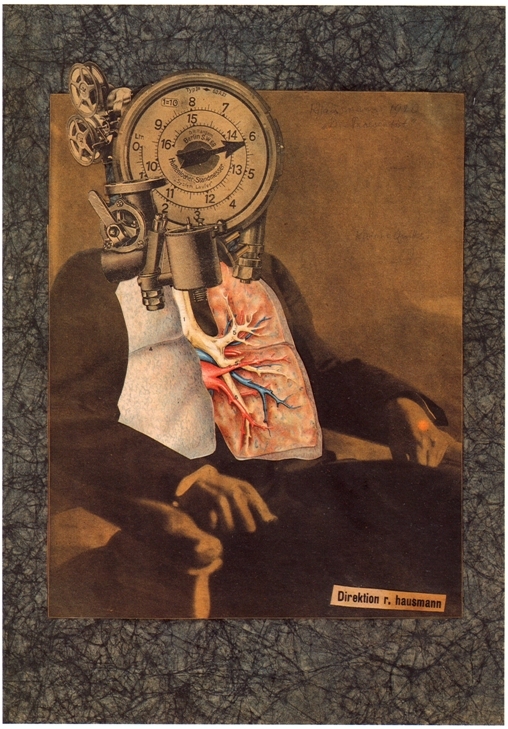 I am not ashamed to say that both of these collage artists are among my favorite sources of rich visual pollen. Watch for a profile of each in future entries here. Hop on it today . 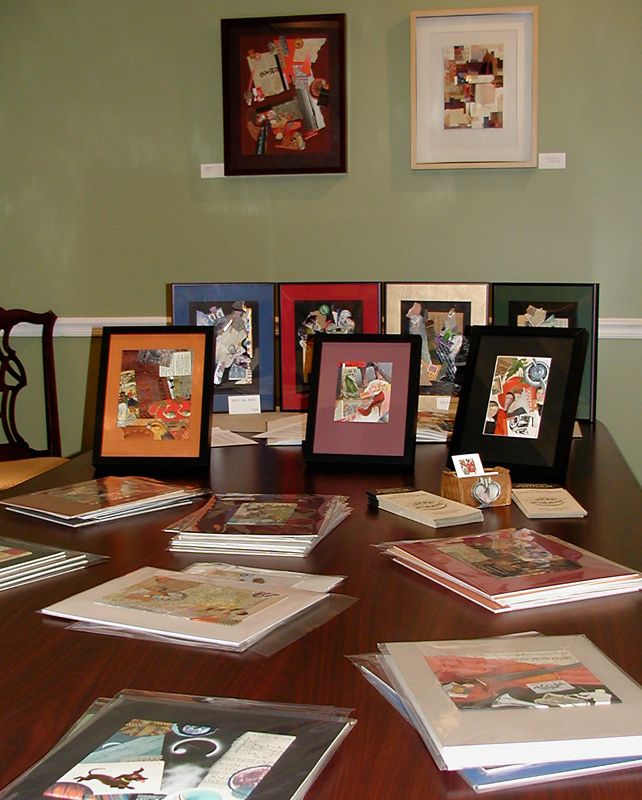 . .
At the recent Gallery Hop Stop in downtown Danville, I was pleased that people sought out my display of collage miniatures, tucked away in the conference room of Tye Financial. 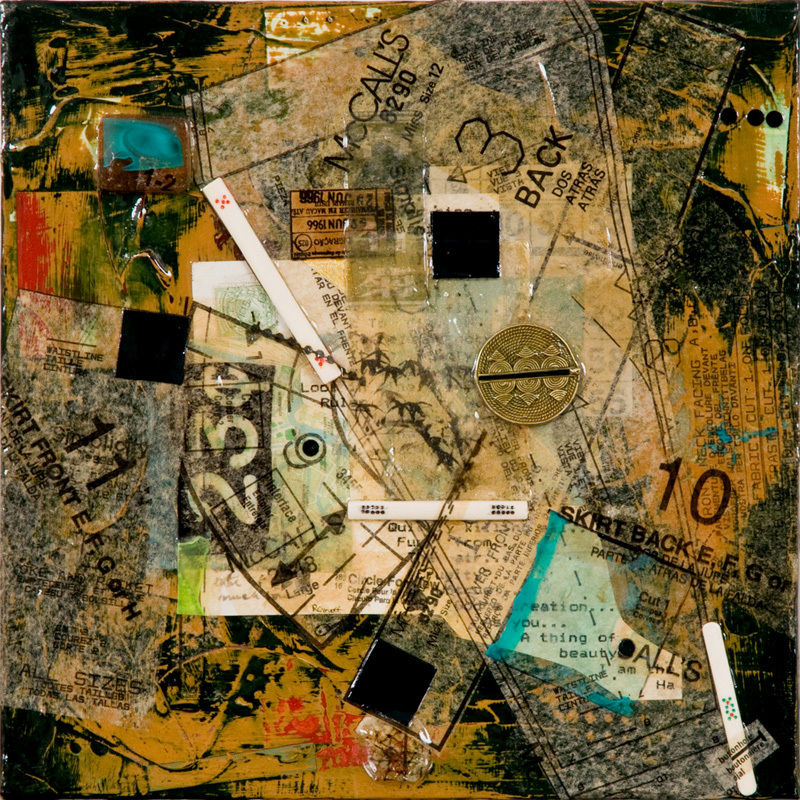 Needless to say, this small town in Kentucky is not a stronghold of contemporary art collectors, but the opportunity to interact with those kind enough to pause and discuss the medium of collage is always a valuable learning experience for me. Most of my hoard is now configured for direct purchase at this site, before all of it is made available to the public at the 2013 ArtTour, Annual Open Studios of Central Kentucky. Go ahead and grab one for yourself before November. 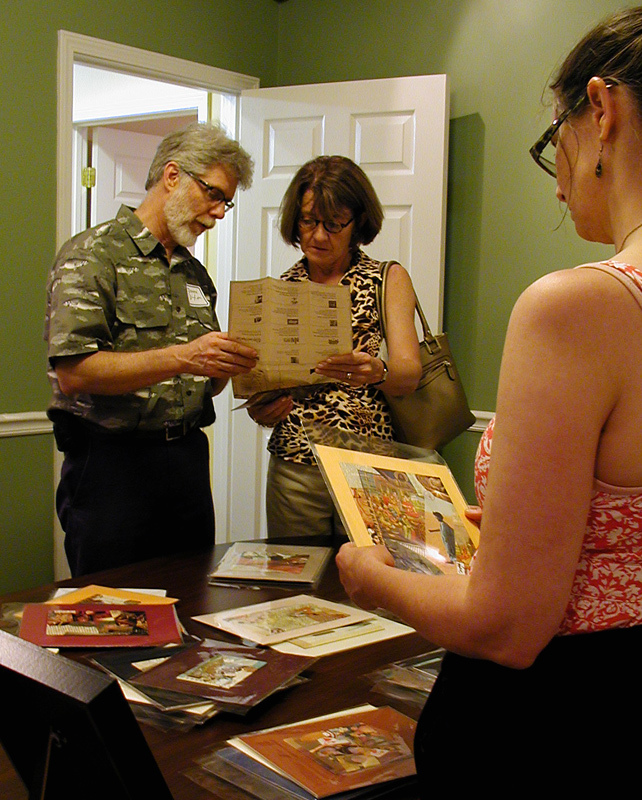 J A Dixon and a recent display of his collage miniatures. This is a small mixed-media-plus-collage landscape. I hand-crafted the frame from weathered Japanese redwood — recycled slats from a fatally damaged patio chair I could not bring myself to throw away. 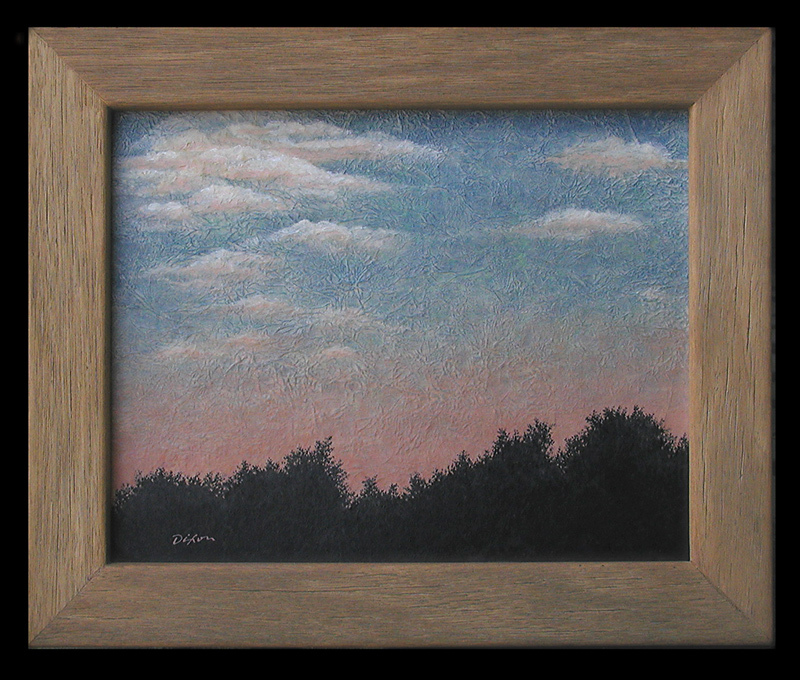 The work currently hangs in the Mahan Gallery at Boyle County Public Library, as part of a “SummerScape” exhibition, which lasts until August 29th. One of the most extraordinary things about having my home studio in downtown Danville is having our library right across the street. 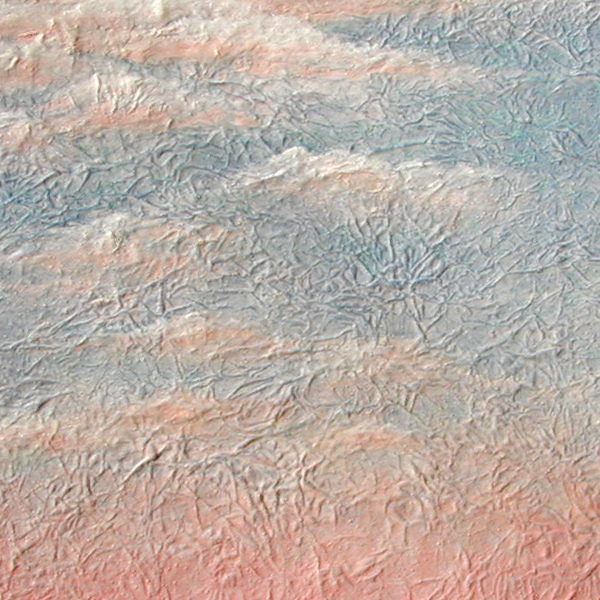 I began with scrunched-up paper and scraps of vellum, applying numerous layers of a thin “acrylic milk,” tinting it with various drops of concentrated liquid watercolors, and adding white tissue along the way to evolve the clouds. The process is a slow manifestation and allows for multiple mid-course decisions as the translucency is gradually built. To be honest, I have not created many artworks using this technique, so please let me know what you think. George R drew my attention to a thought provoking post from 2008. If painting can survive the transition from cave art to Byzantine frescoes, through the Renaissance, the conquest of a new hemisphere, the rise of the machine, and planetary war on an industrial scale, it can surely navigate an emerging globalization based on the total commercialization of culture. A small few will redefine it. Some will understand it. Many will reject it. Most will just consume. Until the next ricochet. Collage grew out of painting. To many, the essence of it has never been anything but painting. 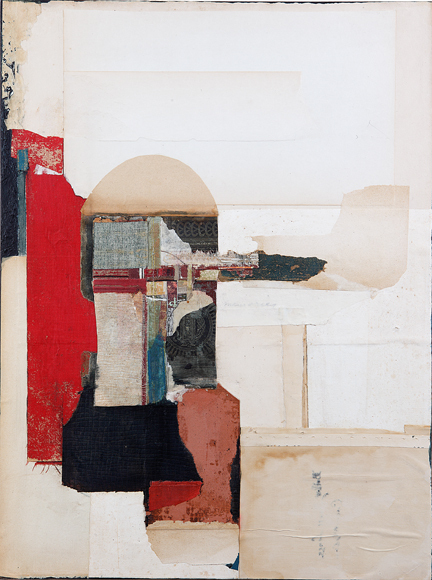 Will others eventually look back and say that collage penetrated and shaped all other media, or will they say that painting reclaimed collage to transform itself yet again? Looking back on a full year as a blogger, many of my initial objectives have been met, but there are even more subjects to tackle in the coming months. 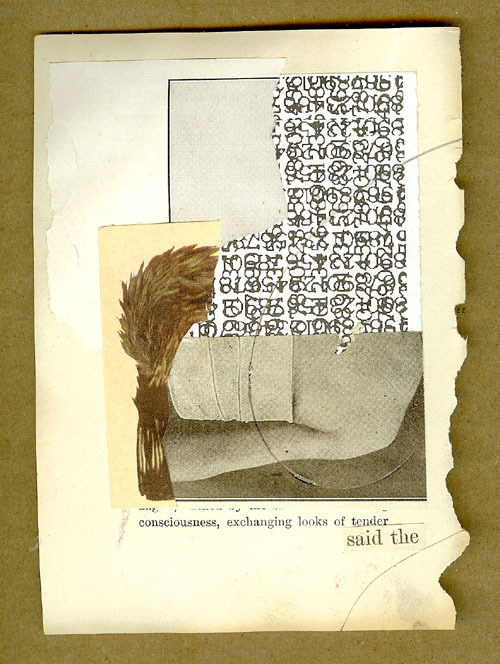 Can I find the right balance between words and images, welcoming others to act as better scribes for what is happening in collage and remembering that I would rather be holding a pair of scissors than typing at a keyboard? The exceptional print quarterly out of Canada, Kolaj, has also celebrated its first birthday. 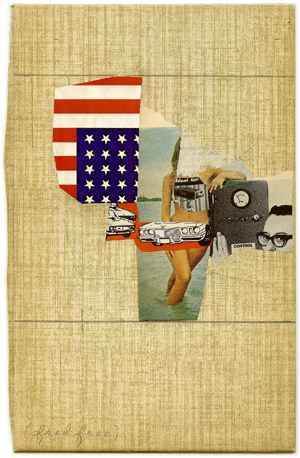 2012 was the perfect year to salute a century of collage as a modern art and also to look around, assessing the current maturity of the practice. 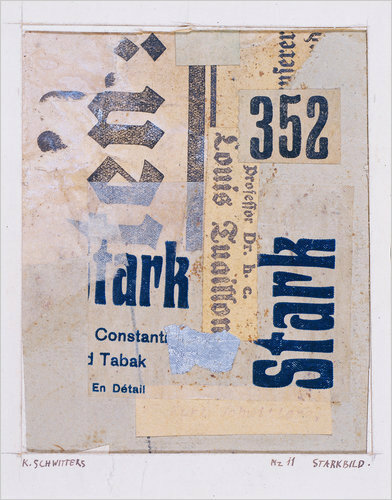 I still have much to say about the pioneers and exemplars — Gris, Schwitters, Hausmann, Höch, Cornell, Hamilton, Johnson — for there is much to observe and absorb about their seminal talismans and bodies of work. 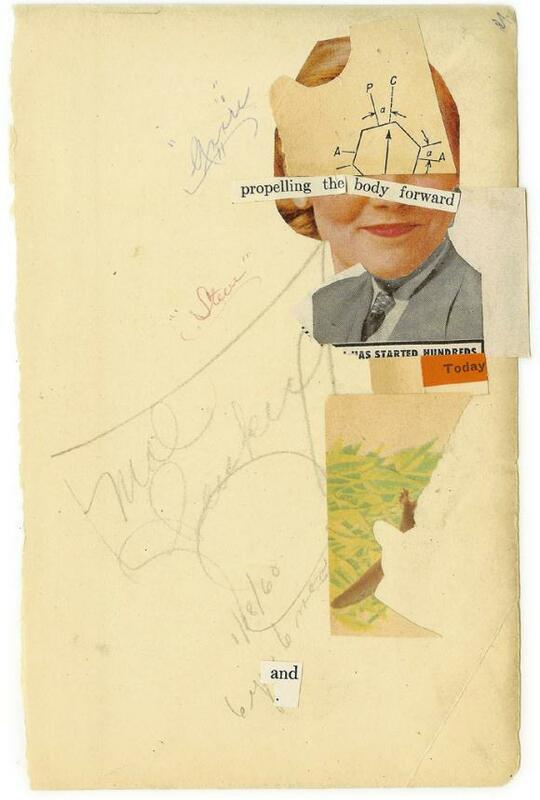 It is equally important to evaluate more of the leading and emerging artists now actively producing what may be known as “post-centennial collage,” perhaps the most vital period of cross-pollinated output in the medium’s history. Where to focus next? 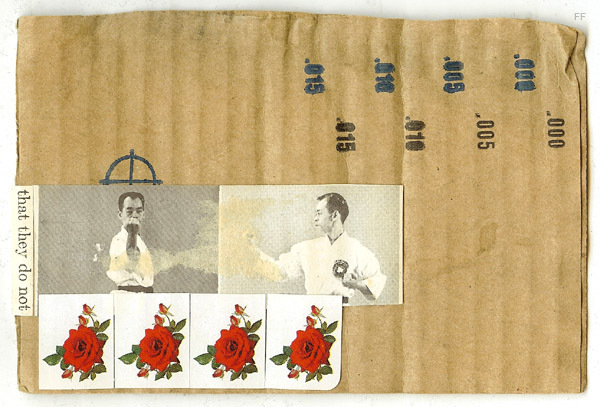 Those who magnify the traditions of Dada, Surrealism, Fluxus, or Layerism? 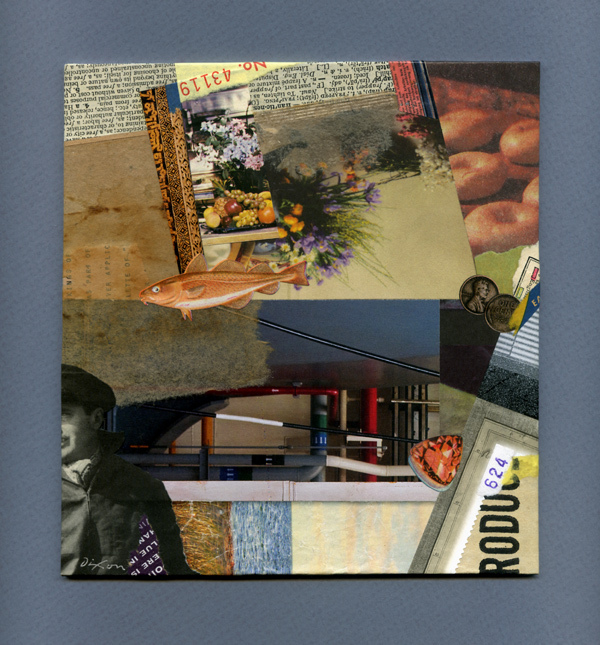 Dedicated collage abstractionists such as Touchon, Dryden, Romoff, or Gordon? Masters of the outer reaches of a Maximalist/Minimalist spectrum such as Kroll, Reitemeyer, or De Blauwer? 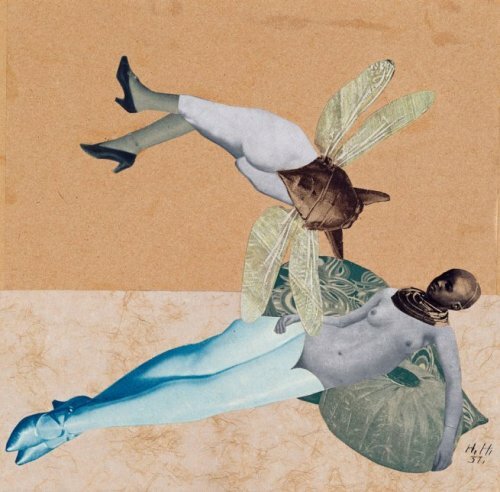 I have for some time lamented the lack of a visual-arts phenomenon equivalent to how musicians have traditionally improvised together, but my recent awareness of dynamic collaborations between collage artists is forcing me to change my mind. Is it time for me to take a closer look at the creative fusions instigated by Collins, Holmes, Daughters, or Wilkin? My, my . . . have we just laid out another year or more of entries? 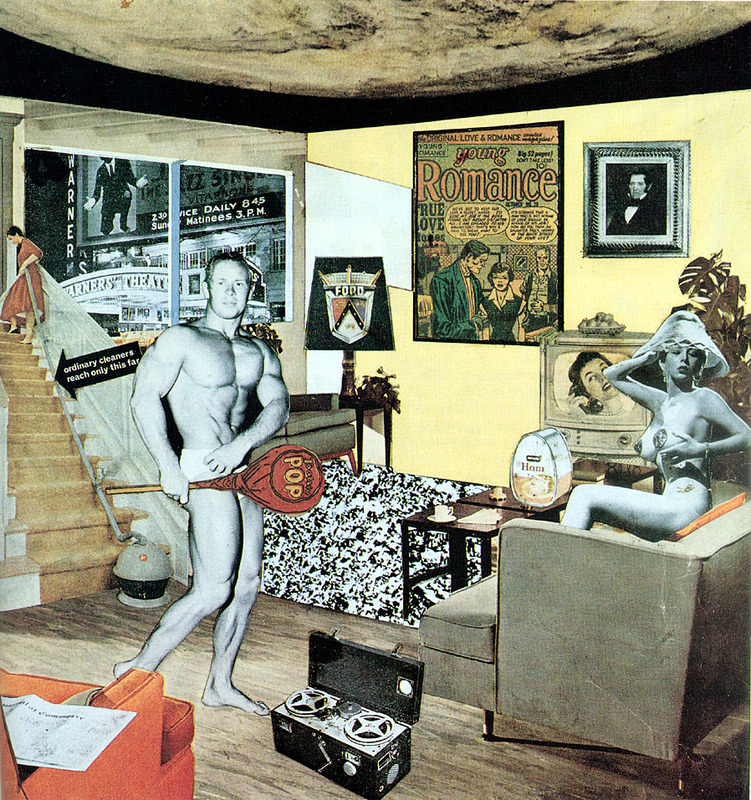 And I have not yet “scraped the working surface” of all the collage artists who make the contemporary scene so exciting. Do I possess the necessary wisdom to tame my ambitions and “shorten sail?” My mind rebels at the idea that I cannot be an artist and a writer, too. I am no scholar, and some art historians would scoff at my correlations, but I cling to the notion that there is a place for insights about our medium that can come only from a person who faces the same challenges as my working peers when confronting a pile of scrap. One more thought: As the digital age sweeps over the planet, is there also taking place a not-so-quiet backlash against the erosion of manual dexterity? If so, is there a more compelling counter-trend example than the current explosion of tearing, cutting, assembling, transferring, and pasting? And beyond the familiar “analog” technique, what can be said about the deep influence of visual collage on the preponderance of montage in all things sensory — music, performance, film, and media design? This site can become a place where all of this is explored, discussed, shared, and challenged. Much of that is up to you, valued reader. Meanwhile, I shall continue to see, write, and make more art. Stop by again, soon! Slowly open your eyes to find yourself in an oddly familiar space that is part tool & die shop, Zen garden, and hi-fi showroom. Mom is there in her polka-dot apron, and somewhere in the next room, The Adventures of Jonny Quest has gone to commercial break. 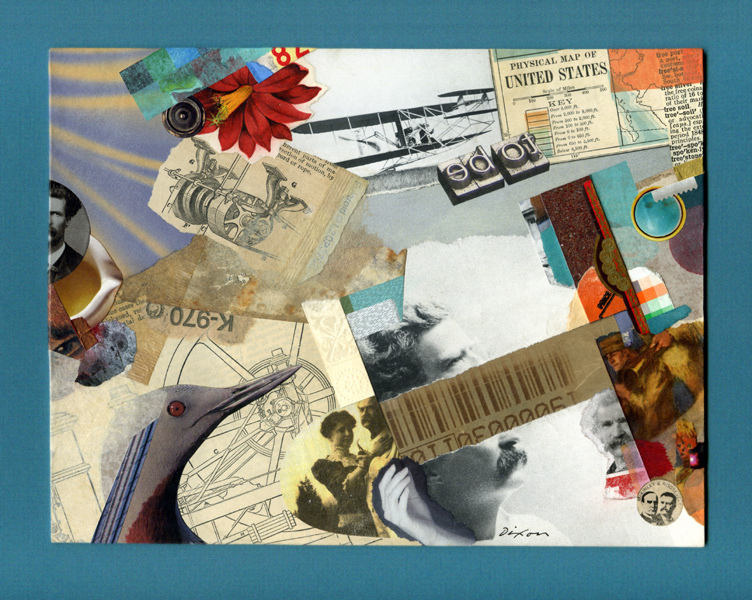 It may well be a surreal warp in quantum time, but, more than likely, it is the distinctive world of a Fred Free collage. I cannot say if Fred Free uses his given name or a pseudonym, but it has never really mattered to me. He is one of the most actively intriguing artists working in the medium today. His superb compositions often look more minimalist than they actually are, offering delightful complexities that blend a clearly restrained interplay of vintage ingredients and street rubbish with moods that fluctuate between reverence for lost motifs, wry humor, and a mild disenchantment with 21st-century culture. While cohering to a recognizably defined vision, FF skillfully explores the spectrum of minimalism to maximalism in collage. In spite of a “yesteryear” oeuvre, he makes adept use of online platforms and social networks, while also effectively promoting visual cross-pollination at Tumblr by “endorsing” other artists with his Variety Showcase. It is highly doubtful that any blogger can evade the pitfalls so evident over a century ago to one of the first modern minds that America produced. 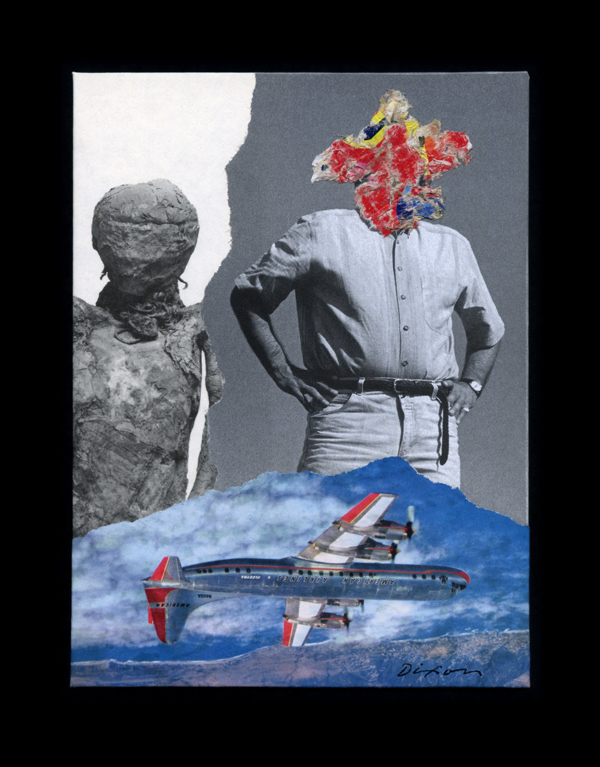 At any rate, I shall attempt to be as candid as possible about my own artwork, as well as the current output of contemporary collage artists. Today’s featured item stumbled badly out of the starting gate and remained in a suspended mode until a color scheme and visual subtext came into focus. What do you think of it? Do not forget that I have a thick skin. As a firm believer that we learn more through a constructive critique than through a casual note of praise, I shall anticipate your comments at this site. Please register today and help make The Collage Miniaturist a destination for those who are not timid about having a frank discussion about this medium. 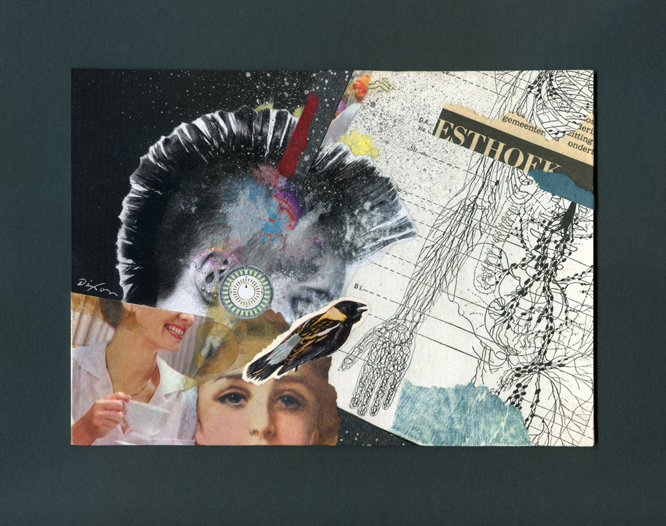 You are currently browsing the The Collage Miniaturist weblog archives for July, 2013.